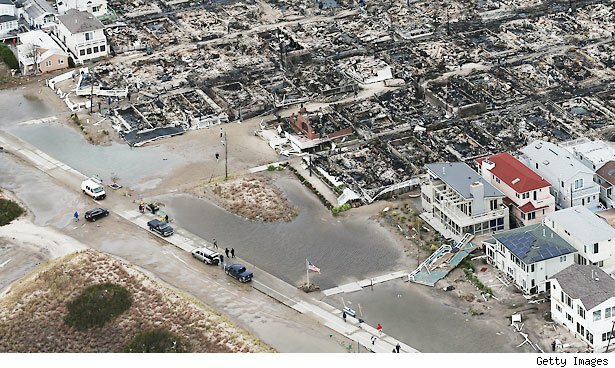 Death, destruction and Mother Nature can prove the ultimate equalizers of those on the high and low ends of the socio-economic totem pole, as Hurricane Sandy so definitively showed. No matter where they stood before the storm, its victims afterward had many of the same needs: food, shelter and flushable toilets. Some "necessities," though, are of a more sophisticated nature. "I had to go to the wine cellar and find a good bottle of wine and drink it before it goes bad," Murry Stegelmann, a founder of investment-management firm Kilimanjaro Advisors LLC, wrote in an email quoted by Bloomberg News after he lost power at his Darien, Conn., abode on Monday evening. He ended up choosing a 2005 Chateau Margaux, which retails for about a thousand bucks. After all -- and for shame! -- there's no government program to install back-up generators in private wine cellars. Meanwhile, a number of jokes circulating on Facebook suggested that GOP presidential candidate Mitt Romney had offered to help those whose second or third homes had been damaged by the storm. Certainly, there's much room for mockery of the hardships the wealthy have had to endure since the storm hit -- way too much humidity in the humidors where they store their Cohibas, the tragedy of water damage to their fine art collections, and poor Mr. Stegelmann, compelled to drink his grand-a-bottle vintages. But the storm that slid like a knife through the East Coast also cut through to a deeper truth, underscoring the wide economic disparities in Manhattan and beyond, according to David Rohde at Reuters in his article "The Hideous Inequality Exposed by Hurricane Sandy." "Those with a car could flee," Rohde wrote. "Those with wealth could move into a hotel. Those with steady jobs could decline to come into work. But the city's cooks, doormen, maintenance men, taxi drivers and maids left their loved ones at home." Rohde cites Census data quoted in The New York Times, which shows that the median income for the poorest fifth of New York City's population was $8,844, down $463 from 2010, while the richest fifth had a median income of $223,285 -- and had risen $1,919 since 2010. That overall wealth disparity, the Times article notes, rivals the gaps between rich and poor in sub-Saharan Africa. One massive storm, yes. But it made landfall in two very different worlds. Something to think about as you uncork another bottle of whatever you're drinking.